How to create a Brightcove dashboard? Brightcove is all about videos. They offer a cloud-based platform to host and distribute your video content, as well as monetize it. You want to compare your Brightcove data to numbers from your other platforms, such as Facebook or Google Analytics? Search no more! DashThis is your new favourite dashboard creator! You just have to connect your Brightcove account into DashThis, and you can create an awesome Brightcove dashboard! There are three parts to complete in order to connect DashThis to the Brightcove API. 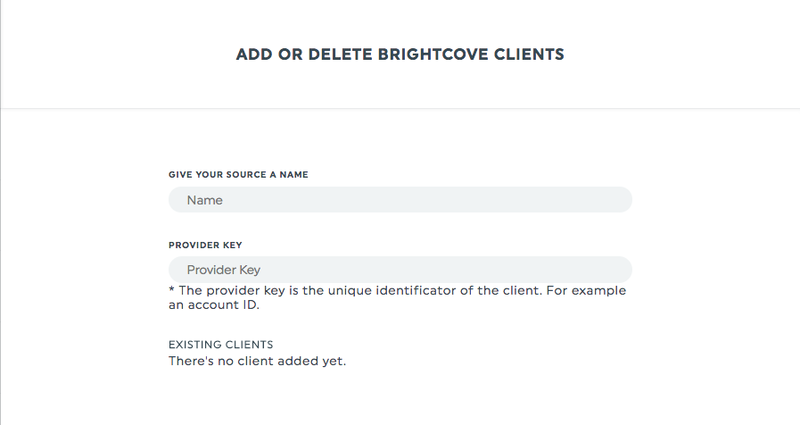 In order to connect your Brightcove account to DashThis, you first need to get your Client ID and your Client Secret. These two pieces of information must be requested through your Brightcove account. Here’s how to proceed. – Open the Admin menu, located at the top right side of your screen. – You then land on a page displaying your current credentials. Click on Register New Application, located on the right-hand side of the screen. • 2 – You can add a short description of the application, but it’s optional. • 3 – Select one or more accounts. DashThis will only have access to the data attached to the account(s) you choose. If you want all your accounts, click on the symbol ». If you want to choose them manually, select them and click on the symbol >. • 4 – Check the box Read under the section Analytics and the box Video Read under the section CMS. These are the minimal requirements for the Analytics API, you can add more if you want to. – Another dialog appears with a Client ID and a Client secret. The client secret will not be displayed again, so be sure you store it in your documents. 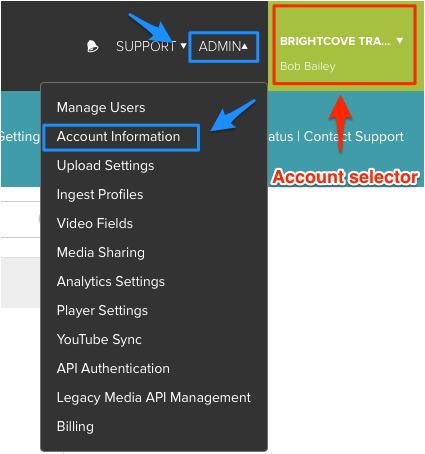 Now that you have these two pieces of information, you can add Brightcove into your DashThis account! 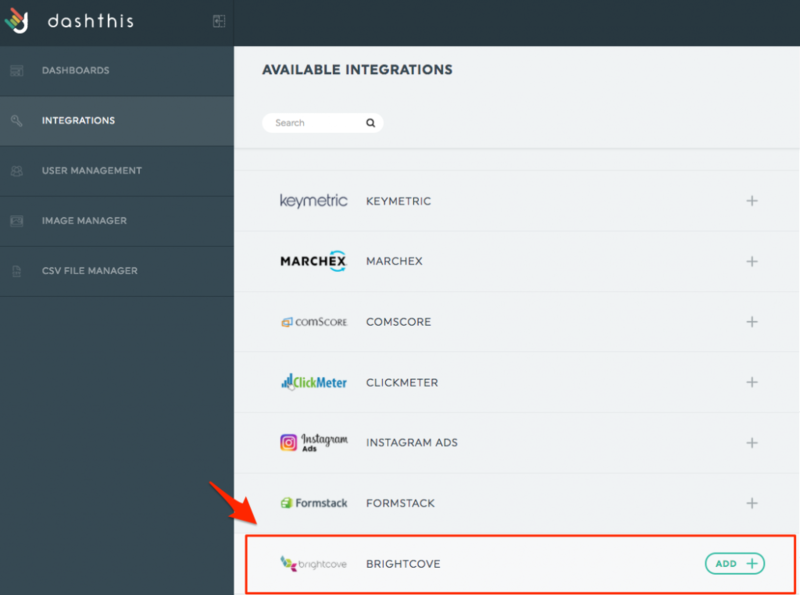 – In the Integration Manager of DashThis, choose the integration Brightcove, and click on Add. – A window containing 3 fields appears on the right-hand side of the screen. – In the Description box, write the name you want to give to your source. This is how your source will be called in our system. 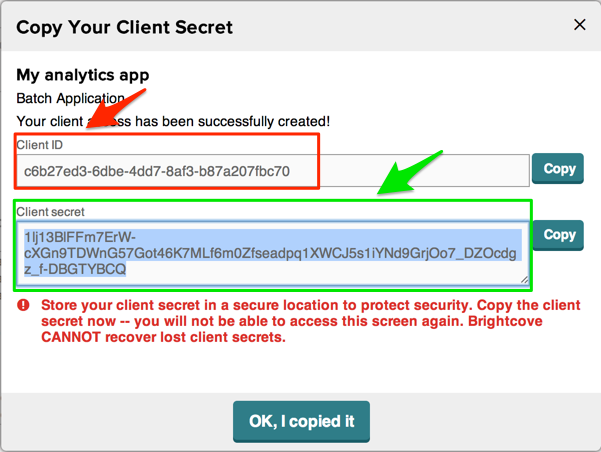 Enter the Client ID and the Client Secret you got from Brightcove in their respective boxes. Brightcove is now connected to your DashThis account! One more step is necessary; you need to add the data sources to your DashThis account. 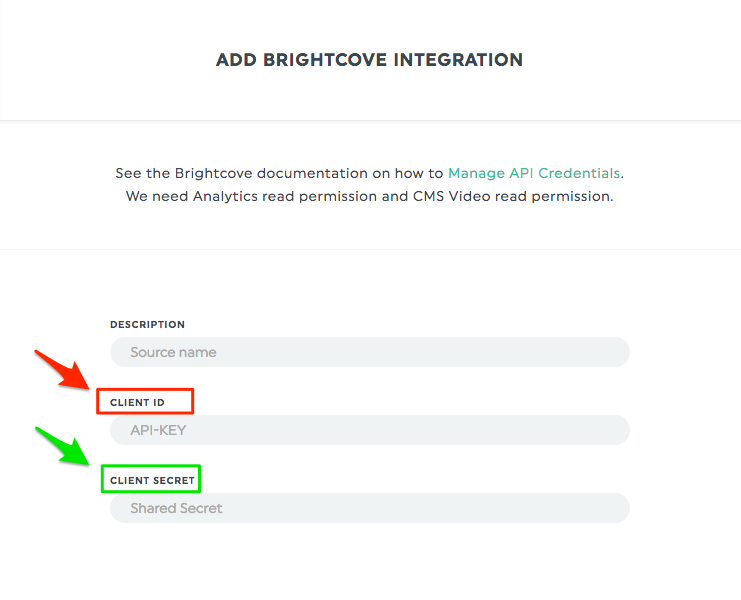 – In the Integration manager, find Brightcove in the column located on the right-hand side of the screen. Click on the pencil icon next to your account name. – Two boxes appear at the right-hand side of the screen: Give your source a name and Provider Key. Give your source a name: It can be anything you want. This name will be how your client will be designated in our tool. Provider Key: This is the Account number you find in your Brightcove account. 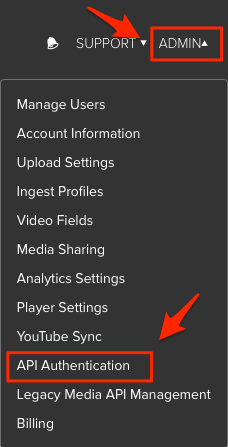 – In your Brightcove account, there is an account selector in the very top right corner of the screen, in green. Select the desired account. – Open the Admin menu. – Choose the option Account Information. – On the next page, you’ll find the Account number! 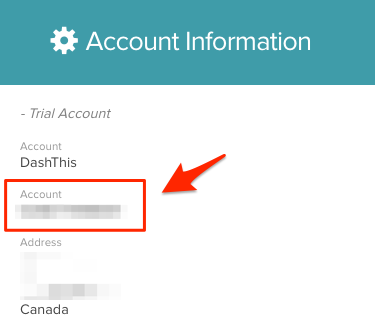 – Enter this Account number in your DashThis account, click on Add client, and you’re good to go! 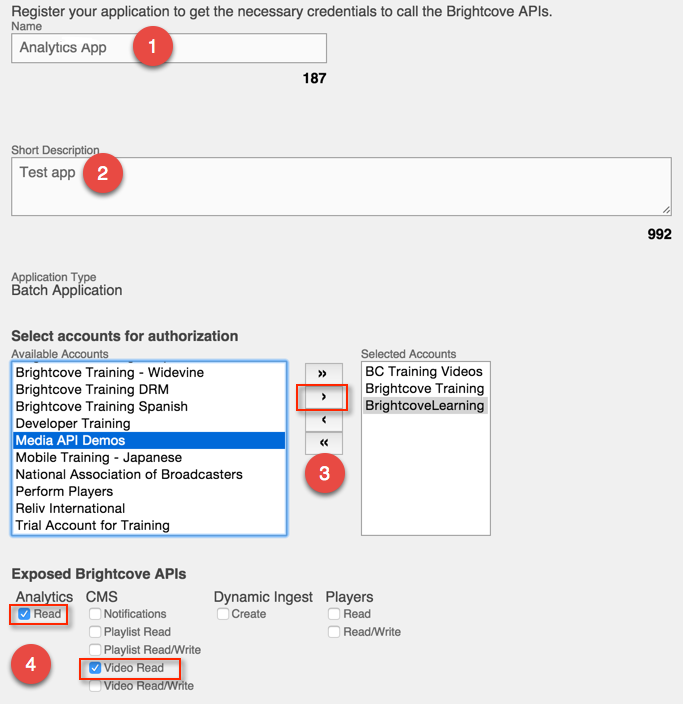 If you have a Brightcove account, it’s now time to add this source to your dashboards! Still don’t have an account at DashThis? Try our tool for free! This entry was posted in Integrations. How to create a Searchmetrics dashboard report? How to create a LinkedIn Ads reporting dashboard? Facebook Insights API Issue: July 23, 2018 How to create a SEMrush dashboard How to use the filters in Google Search Console? How to add multiple Instagram accounts to DashThis ? How to create a Google Analytics dashboard? How to create filters for Google Analytics? How to create a LinkedIn Ads reporting dashboard? How to create a Brightcove dashboard? How to create a Searchmetrics dashboard report? How to create an Instagram Ads dashboard report? How to create automated, white label reports for DoubleClick for Publisher How to create automated dashboards for DoubleClick Digital Marketing? How to create a DoubleClick Campaign Manager dashboard report? How to add Google Display Network Data to an Adwords dashboard? How to integrate a custom data source into a dashboard? How to create a Top Converting Goals KPI for Google Analytics? How to create a master Google Analytics dashboard with all your clients’ accounts? Am I missing any latent conversions in AdWords? How to create a dashboard with Facebook Business Manager? How to deal with expired data sources (integration)? How to get history from social media sources? How to filter on specific Google Analytics goals? How to create custom dashboards using the Adwords Reporting API? How to create reports and dashboards using the GinzaMetrics API? How to create reports and dashboards using the Keymetric Call Tracking API? How to create dashboard report with Clickmeter? How to create reports and dashboards using Bing Ads? How to create reports and dashboards for Formstack? How to create custom dashboards using the Instagram API? How to create custom dashboards using the Twitter API? How to create a report using Google Search Console? What do I need to know about Twitter dashboards? How to a create dashboard report with AdForm? Which Adwords video ads metrics are available to use in my dashboards? What are the changes to conversion columns in Google Adwords? Why are my Moz root domain metrics not working? How to create a KPI to get Twitter impressions for a hashtag? SEO: How to filter Google Search Console (GSC) query data to show non-branded queries? Google Analytics filters and segments: All you need to know How to create a Google Analytics dashboard as a hotel manager? How to work around the Adwords conversion lag? How to create a KPI for active mobile users in Google Analytics? Reduce the length of your Google Analytics non-branded keyword filter How to create an executive dashboard for Google Analytics? How to create a Google Analytics master dashboard for all your clients? How to create a Lead Generation Report template for Adwords? How to use Google Analytics Non-Branded keywords filtering? What are the definitions of Facebook Insights metrics? How to add Adwords Return on Ad Spend (ROAS) to a dashboard? How to segment by Action in Facebook Ads? How to get Adwords call tracking conversions from Adwords? How to add an agency markup to Adwords/Bing cost? How to show cost per conversion for Google Analytics goals? How to see the revenue from Bing conversions? How to get only assisted goals or transactions in Google Analytics Multi-Channel Funnels? What are the AdSense KPIs and metrics? Organic reach and check-ins in Facebook Insights Why is Google Analytics API Adwords data returning zero (0)? How to integrate Google Universal Analytics custom metrics and dimensions in a dashboard? What is the dimension “Placement” in Facebook Ads? How is ”users who clicked rate” calculated for Campaign Monitor and MailChimp? How to get social data using Google Analytics Default Channel Grouping? How to use Avanser call tracking in a Google Analytics dashboard? How to create a dashboard using LinkedIn Pages? How to create a dashboard using Youtube Analytics API? How to create a dashboard using MailChimp API? How to create a dashboard using Campaign Monitor? How to create a dashboard using Marchex call tracking templates? How to create a dashboard using the Smart AdServer API? How to create a dashboard report for Perfect Audience? How to create a dashboard report for the WebCEO SEO tool? How to use Adwords video campaigns in a dashboard? How to create a dashboard report for Majestic? How to create a dashboard report with Ahrefs SEO tool How to create an Adwords dashboard using data filtered by label? How to create custom dashboards using Facebook Insights? How to create a dashboard using Raven Tool data? How to create a master Adwords dashboard with all the clients’ accounts? How to create a dashboard using Comscore? How to create a dashboard using DoubleClick Search API? How to create a dashboard using Quality score for Adwords keywords? How to create a dashboard using Google+? How to create a dashboard using Facebook Ads? How to create a branded or non-branded Google Analytics filter? How to create a dashboard using Google Analytics Multi-Channel Funnels KPIs? How to create a custom dashboard template for Google Analytics or Adwords? How to create a dashboard using Moz? How to create a dashboard using Marchex? How to add multiple LinkedIn accounts to DashThis? How to integrate CallRail tracking data into DashThis? How to consolidate or aggregate data from many Google Analytics accounts profiles? How to remove an integration from an account?